Goethe State Forest occupies 53,587 acres in Levy County, with a small disconnected tract (the Watermelon Pond unit) that extends into Alachua County. There are a number of natural communities in the forest, including mesic flatwoods, dome swamp, sandhill, and hydric hammock. Threatened animals such as the black bear, gopher tortoise, bald eagle and red cockaded woodpecker call the forest home. Old growth longleaf pines and bald cypress are prevalent in the area - the most famous of which is the "Goethe Giant", an immense nine foot diameter bald cypress tree located in the Cow Creek tract. 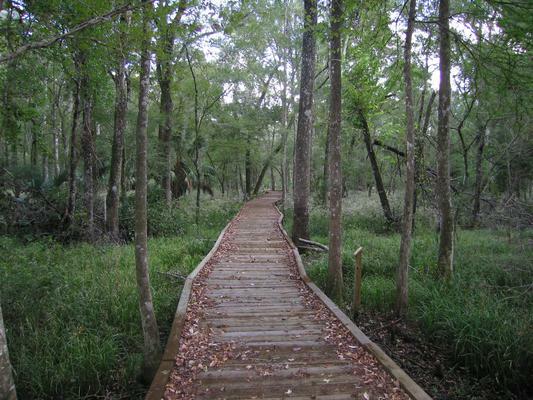 Access is provided by a trailhead along Cow Creek Road that leads to a 1/4 mile trail and boardwalk. There are also picnic tables at this location. A variety of trails are available for hikers, off-road bicyclists, and horseback riding. Whether you are looking for a short hike with the family, or a strenuous back-packing trip, Goethe State Forest has well marked trails for you to explore. Detailed trail maps are available for the most popular routes - see our Maps page for details. Primitive camping is permitted in the forest, but you'll need a permit from the State Forest Service - which can be obtained at the forest headquarters, 3/4 miles south of SR121 on CR337 (see naviagtion link below). Hunting and fishing is allowed in Goethe State Forest with the appropriate permits. The majority (48,000 acres) of Goethe State Forest is also included in the Goethe Wildlife Management Area, which is managed for hunting purposes by the Florida Fish and Wildlife Conservation Commission. Hikers and other visitors should always be aware of the various hunting seasons and use caution in areas where hunting is permitted. Off-road bicycling and horseback riding is allowed on most - but not all - of the trails. Motorcycles and ATVs may not be ridden off the named or numbered forest roads.